A current exhibit (January 25-April 14, 2016) at the Metropolitan Museum of Art in New York City features an in-depth examination of two paintings by famed Renaissance artist Jan van Eyck: Crucifixion and Last Judgment (ca 1440-1441). Particular attention is paid to Crucifixion, a magnificent painting that depicts more than two dozen figures--each with realistic and detailed varied emotional expressions--present at the crucifixion of Jesus. The exhibit conveniently provides a magnifying glass next to the painting so that viewers can examine the fine details and rich colors close up. The exhibit also includes infrared reflectography examination of the paintings, which uncovered several under-drawings that reveal van Eyck's changes as he worked and reworked the paintings. This examination is intended to provide insight into the artist's creative process in arriving at the final version. 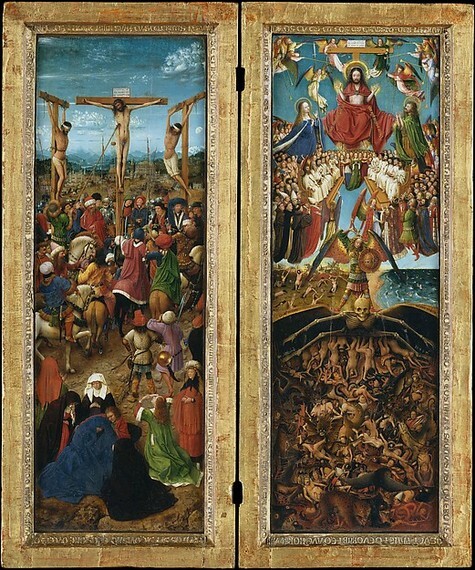 The investigators hoped that the under-drawings and the additional X-radiography and elemental mapping by X-Ray fluorescence study of the frames of the paintings might answer long-standing questions: "Whether the paintings were always intended as a diptych, or whether they were originally the wings of a triptych or the doors of a tabernacle." The curator's comments appear on panels next to the paintings and frames. At the end of the commentaries a note tells viewers that changes in the frames were "likely stipulated by the individual who commissioned the work." But that comment should also have been applied to the changes in the under-drawings and the finished painting itself. The fact is that artists of the period were almost totally subordinate to the wishes and instructions of benefactors who commissioned artworks. Yes, commissions were collaborative efforts, but the patron had the last word. That control included specifications for the content of the artwork, its size, and specific materials down to the last detail, sometimes including colors, pigment quality, and even the amount of gold coloring and gold leaf to be incorporated. These details were set down in contracts that were negotiated by the artist and patron and witnessed by a notary. Not surprisingly, artists were eager to please patrons lest they be criticized and penalized, giving them black marks that could hurt them in a fiercely competitive marketplace for commissions--and even terminate their careers. This picture of the creative process is a far cry from the bulk of commentaries on Renaissance artworks by art historians, curators, and critics, who place the artist at the center, with the patron out of the picture or mentioned in passing. The Metropolitan Museum curator's comment about the probable patron input on the changes in the van Eyck frames is an example. But the curator does not identify or provide any information about the patron. Marginalizing patrons or placing them out of sight feeds the illusion of art historians that Renaissance artists created their artworks in a romantic trance oblivious to the economic, political, social, theological, and personal factors that defined and constrained the creative process. Art historian Jonathan K. Nelson and economist Richard J. Zeckhauser, in their book, The Patron's Payoff: Conspicuous Commissions in Italian Renaissance Art, emphasize the role of patrons. In applying a game theory model to commissions they bring together art history and economic theory to examine multiple factors from these two domains that shaped the business of art: "Commissioned art always conveys information about the patron. Crucial decisions inherent in the creation of a specific work tell a great deal about the person who ordered it... . Specifically, during the Italian Renaissance, the patron selected the artist and paid the bill; the artist acted as the agent charged to carry out the work with skill and aesthetic sensibilities." The authors added that patrons exercised scrutiny and supervision of preliminary drawings and the final product which "helped to ensure that the message conveyed by art reflected the patron's interests." In his book An Artist Empowered artist Eden Maxwell reminds us that Renaissance commissions were work for hire "which was counterpoint to the artist who creates art for art's sake." And the Renaissance Art Connection states it this way: "Artists were still a service business. Unlike today, artists did not create whatever they liked then put it up for sale. Artists were paid to produce exactly what the patron wanted." Among other notable achievements, the Renaissance facilitated the rise of a wealthy merchant class that rivaled the wealth of royalty and the Church. Competitive conspicuous consumption was rampant, as the affluent sought self-aggrandizement in lavish visible displays of their riches. In his book Wealth and the Demand for Art in Italy, 1300-1600, economic historian Richard Goldthwaite concluded that for affluent patrons in Italy, commissions "expressed their sense of what constituted noble status." It is fortunate for us today that the wealthy chose art and architecture for their conspicuous consumption. Without the support of these benefactors, it's doubtful that the massive collection of Renaissance artworks that we treasure would ever have materialized. In view of the powerful personal motives and expenses entailed in commissioned artworks it's not surprising that commissions were governed by detailed legal contracts that specified fine points reflecting the patrons' conception of the artwork. O'Malley describes the central role of the patron in many of the contracts she uncovered. For example, the contract between renowned Renaissance artist Piero della Francesca and members of the Confraternity of the Misericordia states that "[It will be painted] with those images and figures and embellishments that will have been told to him by the above named Prior and Councellors or their successors in office and by the said other elected men named above." Pietro Perugino's1497 contract with the convent of Santa Maria at Vallombrosa shows how content-specific a contract could be. It designated "the size that the main panels and that the predella [platform] should be made, precisely indicating that the Virgin was to be depicted seated and surrounded by cherubim, seraphim, and eight music-making angels, and listing each saint to be painted, observing what each should wear, his attribute, his placement on the panel, and even the colour of the friar-saints' habits." Similar precise demands for embellishments surely constrained the creative process as in the altarpiece Resurrected Christ, commissioned by the Griffi bothers with painters Marco d'Oggiono and Giovanni Antonio Boltraffio: "The risen Christ was to be shown wrapped in a sheet touched with gold and finished with golden fringes, and the figures of the Annunciation on the carved surround were to wear robes enlivened with traces of gold." Frequently, though, detailed information about the subject matter wasn't included in contracts, but not because it was left to the artist. According to O'Malley, content specifications might be sketchy with the understanding that they were "intermediate decisions" subject to change through "verbal exchange" as the artwork developed. Nevertheless, it was clear that the patron made determinations as the painting progressed. For example, the initial contract might call for a number of saints to be named later, as recorded in notes by artist Alesso Baldovinetti in 1470. He wrote that his contract to paint a tabernacle for Sant'Ambrogio specified "the fee, the materials he was required to supply, and noted the main figure and the number of additional saints he had agreed to paint." Similarly, Filippino Lippi's contract (1487) stipulated that he was to paint two large scenes in the Strozzi chapel, the specifics to be given later by the client. In another citation O'Malley shows that the content reflected the patron's choices not the painter's in Perugino's altarpiece for San Pietro, in Perugia. This contract specified images of the ascension of Christ with the Virgin, the apostles, and angels. The finished work includes Saint Paul, the placement of which was inappropriate and not likely the choice of the painter, according to O'Malley. She says the addition was no doubt insisted on by the friars because the chapel was dedicated to Peter and Paul. In many cases, the artist participated in shaping content. O'Malley cites changes made by Leonardo da Vinci in his famous painting Virgin of the Rocks, commissioned in 1483 by Prior Bartolomeo Scorlione and the Milanese confraternity of the Immaculate Conception for the church of San Francesco Maggiore in Milan. "It [the painting] does not represent the type of virgin noted in the contract and the lista, and there are changes in the figures originally stipulated for the altarpiece." The contract called for a depiction of the Virgin and child with angels and two prophets. The actual painting pictures the Virgin and child with John the Baptist. O'Malley explains that Leonardo probably suggested changes because the altarpiece most likely already had the image specified in the contract, and Leonardo didn't like the idea of repetition. In any event, Leonardo's version was approved. The point here is that artists participated in determining and developing subject matter and were often listened to--but the patron held final judgment. Also, it's likely that artists would suggest changes in accord with their perception of the patron's beliefs, wishes, and intentions--and nothing maverick or challenging that might raise ire or displeasure. Contracts commonly required artists to pay for materials. That's why artists might sometimes cut corners in applying less expensive pigments. In one instance reported by O'malley, Luca Signorelli did not use ultramarine for the robe of the Virgin specified in the contract for a 1519 altarpiece. The client charged breach of contract. Luckily, Signorelli got off lightly when he promised to repaint with the expensive ultramarine pigment. In addition to the conspicuous consumption of commissioning costly lavish artworks, religious paintings were intended to celebrate Christianity and show the patron's devotion to the faith. This was evident in the 1485 contract for frescoes in Giovanni Tornabuoni's chapel in Santa Maria Novella cited in The Patron's Payoff. The contract clearly stated that the artwork was offered "as an act of piety and love of God." Similarly, another Florentine patron, Giovanni Rucellai, said to his descendents that his commissions brought him "the greatest contentment and the greatest pleasure because they serve the glory of God, the honor of the city and the commemoration of myself." Other patrons "wanted God and the saints to see their devotion and hoped that their commissions would help reduce their time in purgatory." With these deeply personal religious motives it's no wonder that patrons would monitor the progress of their commissions with strong hands-on attentiveness and control. The devotional element in Renaissance religious art can be seen in varying degrees in all religious art of the period; patrons sought powerful Christian images, messages, and display of their piety. This pervasive intention supports a subject I've written about extensively: the falsification of biblical history by omitting Jesus' connection to Judaism. A vast trove of Renaissance artworks typically pictures Jesus and his family as blond fair-skinned Northern Europeans surrounded by anachronistic Christian saints and artifacts. These figures were often portrayed in palatial settings alien to Jesus and his family's Jewish identity as dedicated practicing Jews residing in a rural village in Nazareth. Art historians to whom I've spoken attribute these omissions to Renaissance artists' embrace of technical advances and practices in art, such as contemporizing figures, embracing realism and naturalism, and reviving Greek idealism. In view of revelations about the prominent role of patrons in controlling the content of their commissions there is a simpler more obvious explanation: Patrons demanded totally Christianized artworks that expressed piety and devotion. This overarching motive allowed no room for content that would undermine or challenge that conception. Thus, the inclusion, or even hint, of Jesus as Jew would not be an issue or question. Unfortunately, the omission masked the common foundation of the two faiths and fostered a wedge between Judaism and Christianity that reverberates today. Perhaps it's time for corrective action. The revolutionary findings documenting the important role of patrons and other factors in the creative process begs re-examination of art history of the late Middle Ages and Renaissance. Patrons must be retrieved from the shadows and recognized as at least equal partners in the creation of commissioned artworks. Moreover, art historians, curators, and critics should consider giving face and voice to patrons in exhibits, critical reviews, as well as texts and other writings about Renaissance art. They might also note the falsifications of biblical history that were byproducts of a narrow ideologically driven perspective deeply entrenched in an anti-Semitic society. These falsifications are clearly visible to the naked eye and do not require infrared reflectography or X-rays to uncover them. In addressing these issues art professionals can seize an opportunity to educate students and other art lovers about the broad scope of influences that shaped remarkable Renaissance artworks. Bernard Starr, PhD, is Professor Emeritus at the City University of New York (Brooklyn College). His latest book is "Jesus, Jews, and Anti-Semitism in Art: How Renaissance Art Erased Jesus' Jewish Identity and How Today's Artists Are Restoring It." He is also organizer of the art exhibit "Putting Judaism Back in the Picture: Toward Healing the Christian/Jewish Divide."